You will see that opinions vary with regard to the date of formation of B.S.A. - anywhere between the mid 1850s and the late 1860s. In their own immediately post-war history of the First World " Great" War of 1914-18, - " The Munitions of War"
B.S.A. themselves declared that the Company had been in existence for 51 years. Please read through the four alternatives and draw your own conclusions! The answer really depends upon a determination of such point as you deem relevant to any particular part of the development of B.S.A. 's various formative and associated companies. However, probably the best reference relating the circumstances under which, and the period over which, the grouping of Birmingham gunsmiths metamorphosed into the Birmingham Small Arms Company, can be found in their own later company history of the period of the Second World War (1939-45), "The Other Battle". 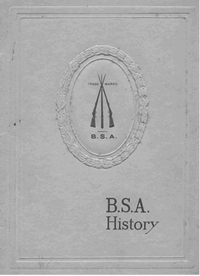 This third short history extracted below probably gives the most detailed, yet succinct, description to post World War II times..
Additionally, the link here will take you to our page carrying complete BSA catalogues from 1908 to the 1930s - in PDF format. The Birmingham Small Arms Company (BSA) was founded in 1861 by fourteen gunsmiths in Birmingham, England, to supply arms to the British government during the Crimean War. The company continued after the conflict but branched out into other fields; in the 1880s the company began to manufacture bicycles and in 1903 the company's first experimental motorcycle was constructed. Their first prototype automobile was produced in 1907 and the next year the company sold 150 automobiles. By 1909 they were offering a number of motorcycles for sale and in 1910 BSA purchased the British Daimler Company for its automobile engines. During World War I, the company returned to arms manufacture and greatly expanded its operations. BSA produced rifles and Lewis guns, but also shells, motorcycles and other vehicles for the struggle. In 1920, it bought the assets of a short-lived plane builder Airco. By World War II, BSA had sixty-seven factories and was well positioned to benefit from the demand for guns and ammunition but it also 126,000 M20 motorcycles. Post-war, BSA continued to expand the range of metal goods it produced. The BSA Group bought Triumph, making them the largest producer of motorcycles in the world. The company made automobiles in 1907-1915, 1921-1926, 1932-1939, and 1960. The Daimler nameplate produced cars for BSA from 1910-1915 and 1915-1960. Lanchester cars also became part of the BSA. There were cars bearing the BSA name itself from 1930-1939. In 1960 Daimler was sold off to Jaguar. The Group continued to expand and acquire throughout the 1950s but by 1965 competition from Japan and Germany was eroding BSA's market share. By 1972 BSA was so moribund that it was absorbed into Manganese Bronze in a rescue plan initiated by the Department of Industry and many of the acquisitions were separated or sold. The motorcycle business was hard hit - plans to rescue and combine Norton, BSA and Triumph failed in the face of worker resistance and Norton's and BSA's factories were shut-down, while Triumph staggered on to fail four years later. Only the limited NVT Motorcycles survived. Enjoying the rights to the BSA marque, it was bought-out by the management and renamed the BSA Company. In 1991 BSA Company merged with Andover Norton International Ltd., to form a new BSA Group, largely producing spare parts for existing motorcycles. In December 1994 Colquhoun and Jackson's BSA Group was taken over by a newly formed BSA Regal Group. The new company, based in Southampton, has a large spares business and has produced a number of limited-edition, retro-styled motorcycles. On 7 June 1861 the Birmingham Small Arms Trade Association (formed in 1854 by some of the city's master smiths) decided to form a public company, the Birmingham Small Arms Company Limited. Their stated purpose was to make guns by machinery. By 1863 the factory at Small Heath was complete. In 1866 it acquired its munitions factory in Adderley Park, Birmingham. From 1880 it went into bicycle manufacture, making its own designs from 1881. Between 1888 and 1893 it devoted itself solely to production of a new magazine rifle, returning to the cycle industry in 1893 with the manufacture of cycle hubs and other components. In 1906 it took over the National Arms and Ammunition Company's premises in Sparkbrook and acquired the Eadie Manufacturing Co. Ltd. of Redditch in 1907. In 1910 it acquired the Daimler Co. Ltd. of Coventry. Following concentrated production of the Lee Enfield rifle during World War I and further expansion, in 1918 it put its three main activities under separate management. BSA Cycles Ltd. (at Small Heath and Redditch), BSA Guns Ltd. (small arms work at Small Heath), and BSA Tools Ltd. (at Sparkbrook). Daimler returned to normal production at Coventry. From 1918 it also acquired Burton Griffiths and Co., William Jessop and Sons (1920) and Birtley Co. Ltd. (1939). During the Second World War, New Hudson Ltd., Sunbeam Ltd. and Ariel Motors Ltd. were also to join the Group. A post-war boom in motor cycles meant that BSA Motor Cycles Ltd. was created in 1953 (separate from BSA Cycles Ltd.). In 1951, the Group purchased Triumph Engineering Co. Ltd., and in the mid-1950s, Carbodies of Coventry and the Idoson Motor Cylinder Co. Further companies, such as BSA Broach Co. Ltd. and BSA Small Tools Ltd. were also created from existing BSA companies as designs and production were developed. Daimler was sold to Jaguar Cars Ltd. in 1960. In 1973, BSA was taken over by Manganese Bronze Holdings Ltd., which held Norton Villiers. Norton Villiers and BSA were merged to form NVT Ltd.
Reference: BSA Group News (Birmingham, 1961). The third description from Chapters I and II of "THE OTHER BATTLE" by the B.S.A. Co.
and sea-coal out of Staffordshire." But these craftsmen, skilled as they might be, were far from being able to satisfy their country's military needs, and Henry VIII had to import Italians to teach the art of making bronze cannon, Dutchmen to make shells and bombs, and Flemings to make armour and swords. It was not only in arms that England lagged. Virtually all gunpowder was imported from Antwerp until the lesson of the Armada in 1588 when Howard of Effingham and Drake were prevented from destroying Philip's fleet off Plymouth before it sailed up the Channel by a desperate shortage of powder which forced them to break off action after their preliminary victory. By the time of the Civil War the manufacture of arms had become an established trade in Birmingham. Indeed, the industry was so important that in April, 1643, Prince Rupert sacked and burned part of the town to stop its flow of weapons to the Parliamentary forces, whose cause it favoured. It was towards the end of the 17th century that there occurred the most important development in the city's history of arms manufacture. Although the fame of Birmingham swords had already spread abroad—a traveller visiting Milan and noting the "fine works of steel there" observed that "they could be had better and cheaper in Birmingham" — it had not apparently reached London, and the British Army was still equipped with Dutch weapons. The King, William III, expressed concern that guns and swords were not made in his dominions and had, therefore, to be procured from Holland "at great expense and greater difficulty". This system of group contracting by the Birmingham trade continued for 150 years, during which time enormous quantities of firearms were supplied not only to the British Government but also to foreign armies; in fact, in the period of war which ended with Waterloo it is estimated that the 7,000 people employed in the city were producing weapons at the rate of 525,000 a year. Although after the Napoleonic Wars Government orders naturally declined, Birmingham still manufactured immense numbers of complete weapons in addition to supplying barrels and locks to gunmakers in all parts of the country. By far the largest numbers of the finished guns, weapons of the cheapest variety, were bought by London and Liverpool merchants, who bartered them with African natives for ivory, spices and gold. 1848, orders flowing in from Sardinia, Sicily and Denmark, and not only did the Birmingham makers fulfil big contracts for new weapons but, what was more, they were able to dispose of large quantities of old stock at enhanced prices. It was at this period that a new factor commenced to make its influence felt in the industry — the machine. Although Birmingham supplied 156,000 rifles for the British forces in the Crimea between December, 1854, and April, 1856, against 75,000 obtained by the War Department from all other sources at home and abroad in the same period, it began to feel towards the end of the war the competition of the Government factory at Enfield, which had been established at the beginning of the century. In the summer of 1855 Enfield had started to produce weapons by machinery, and by the time peace was declared in April, 1856, it had attained output of more than 2,000 rifles and carbines a week; thenceforward its activities had a progressively adverse effect on the trade of Birmingham. The city's gunsmiths continued to preach the gospel of the hand-made weapon, but inevitably it was a losing struggle. Orders dwindled to such an extent that they were forced to a decision; they must either buy machinery or go out of business. Finally, at a meeting of members of the Birmingham Small Arms Trade in June, 1861, it was resolved to form a company, "The Birmingham Small Arms Company", to manufacture euns by machinery. WITH an initial capital of £24,500, the first step of the Birmingham Small Arms Company was to buy its present chief site at Small Heath—25 acres at £300 an acre—and to build thereon a factory at a cost of £17,050. To link the new works with Golden Hillock Lane, the main thoroughfare in the neighbourhood, a road was constructed on the company's land. It was named Armoury Road and along it down the years millions of guns were to pass to the battlefields of the world. During the first two years of its existence the company's affairs were administered by a committee consisting of all its shareholders. Not very surprisingly it proved a clumsy form of control and at an extraordinary general meeting held on September 30, 1863, there was elected a board consisting of Mr. J. D. Goodman, Chairman; Mr. J. F. Swinburn, Vice-Chairman; Mr. Joseph Wilson, Mr. Samuel Buckley, Mr. Isaac Hollis, Mr. Charles Playfair, Mr. Charles Pryse, Sir John Ratcliff and Mr. Edward Gem. By the end of the year preliminary work was begun on the company's first big order—20,000 Enfield rifles for the Turkish Government. This was part of a contract for 50,000 placed with the Birmingham trade and was secured through the good offices of Mr. Goodman. Mr. Goodman, who remained chairman until his death in 1900 at the age of 83, might well be described as the company's guardian angel. Certainly but for his enterprise and his unceasing battle on behalf of the company (and of the private arms trade in general) it is doubtful whether B.S.A. would have survived some of the crises through which it passed in the latter part of the 19th Century.When rifle contracts for the British Army failed to materialize he did not hesitate to take the matter to Cabinet level and, on one occasion, to the then Prime Minister, Lord Palmerston. With the passing of the years the company, directors and workers alike, indeed the whole of the Birmingham gun trade, came to feel, with some justice, that, except in times of national crisis, they were doomed to be the unwilling sacrifice on the altar of Enfield, which remained the principal Government source of small arms. that for the first time a night shift was instituted at Small Heath and an output of more than 3,000 conversions a week was eventually attained. The first batch of 50,000 was completed in 10 months, the last being delivered for Government inspection a quarter of an hour before the contract time expired. The achievement was regarded at the War Office as a miracle. But it was a miracle that B.S.A. and its workmen were to repeat again and again in years to come in times of international crisis. To mark the occasion the directors presented the three foremen chiefly responsible for executing the contract with a special bonus of £100 each, an action at that time without parallel in the industry. The whole order for 100,000 conversions was finally completed in February, 1868, seven weeks before the day named in the contract. With large contracts from foreign countries B.S.A. was by this time the largest private arms company in Europe and Small Heath was working to capacity. Nor was research being neglected, for the company was continually experimenting on the improvement of rifles. In 1865 a B.S.A.- built Whitworth weapon had won an open contest for a small-bore breech-loading rifle; while in the following year a B.S.A. muzzle-loading rifle had triumphed in the Queen's prize at the National Rifle Association meeting, then held at Wimbledon. The outbreak of the Franco-Prussian war found the Government nervous of being involved and unprepared for a major campaign. In consequence B.S.A. was asked as a matter of extreme urgency to state the number of Snider rifles it could turn out by the end of the following March. The company, however, was in a difficult position. With no Government work on hand or likely, almost all the machinery had been adapted to fulfil a Russian contract for rifles. Work on this order had not begun because of last minute alterations to the design. The company had, therefore, been unable either to take up fresh work—it could have obtained enormous orders from the belligerents—or to proceed with the contract in hand. But whatever treatment it had received in the past from Whitehall, it recognized the supply of new rifles to the British Army as the national emergency it indeed was and again stepped into the breach. of surplus stocks of all weapons not required by Britain. Another problem was labour. Numbers of skilled men, who had been dismissed earlier in the year, had to be found andre-engaged or else replaced; no easy matter when craftsmen were in great demand. However, all difficulties were overcome and the weapons duly delivered to time. The War Office at once intimated that the company could expect contracts for the 48,000 rifles it had stated it could make in the next 12 months, but with the collapse of France and the signing of peace in May, 1871, the crisis was over and the orders did not materialize. same thing as work which would have kept the factory on full time and its employees together. the United States and had deliberately held back B.S.A. 's entry in the hope that the order would go to one of the American companies, from which a larger commission could be expected. An order from the Prussian Government for 40,000,000 cartridge cases caused an internal reorganization at Small Heath in 1873. The old company went into voluntary liquidation, its assets being sold to a new company, "The Birmingham Small Arms and Metal Company", and by this title it continued to be known for 24 years until 1897, when the ammunition business, which had been centred at an Adderley Park factory, was sold to the rapidly expanding Nobel interests (forerunner of Imperial Chemical Industries) and the company reverted to its original title. An indication of the significance of the Birmingham Small Arms Company in Great Britain by 1948, just four years after the Second World War, is a list of their subsidiary companies. At this time, the Company Chairman was the flamboyant Sir Bernard Docker, perhaps most publicly known both for his seemingly extravagant gold-plated Rolls Royce and his extrovert and expensively dressed wife, Lady Docker. The Lanchester Motor Co. Ltd.
Cardiff Foundry and Engineering Company (1947) Ltd.
Burton Griffiths & Co. Ltd.
J.J. Saville & Co. Ltd.
Bromley, Fisher & Turton Ltd.
Metal & Plastic Compacts Ltd.
Because some companies in the Group had not always been able to show a profit after the War, and the Finance Act precluded offsetting the losses of one company against another unless all companies and their assets were wholly owned by the group, in August 1947 the B.S.A. Co. bought the assets of all their subsidiaries and subsidiary companies. This was the factor which explained unusual annual figures in the group's 1948 statement of accounts.